View More In Refrigeration Equipment - Page 4. Keep food safely at or below FOODSAFE guidelines of 40 degrees F for up to 8 hours without the use of unsanitary ice baths or electricity with the CM110103 Coldmaster 1/2 size insulated food pan from Carlisle. Coldmaster food pans are insulated with a non-toxic refrigerant gel that can be recharged by freezing overnight. Coldmaster food pans fit into standard size food pan templates. The CM110103 is a half size for maximum flexibility. 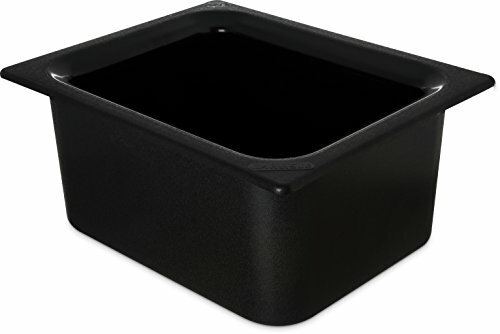 The 6 quart pan measures 12.73 x 10.36 x 6.01 inches (L x W x H). Coldmasters are ideal for use in front-of-house operations for buffet service areas, food bars, coffee stations or condiment bars and back-of-house food preparation and storage areas. The CM110103 comes in an elegant black color. Coldmaster insulated food pans are dishwasher safe for easy cleaning. They are approved by the National Sanitation Foundation and the FDA.